Subproject B5 will investigate and design invasible Networks-on-a-Chip, in the following called iNoCs with emphasis on three major research fields: a) novel router functions and protocols for invasion of communication channels, b) detailed link characterisation and prediction through run-time monitoring for improving communication and resource utilisation by means of self-adaptation, and c) decentralised algorithms and strategies for low cost and low latency embedding of application-specific communication patterns, i. e., topology requests, while considering contention and temporal faultiness of links and nodes. Decentralised Executive for Invasion of Communication Networks: An iNoC shall be able to perform hardware-assisted allocation and management of i-let specific communication channel requests. Here, novel protocols, methods and interfaces have to be defined that allow to transfer and execute link invade-, infect- and retreat-commands within the iNoC. The distinguishing capabilities of an iNoC include Quality of Service (QoS)-aware routing strategies (selection of different routing algorithms combined), parallel link invasion, run-time mapping of logical communication path requests and topologies onto physical resources (e. g., for trees/arrays, uni-/bidirectional communication, uni-/broadcasts) as well as the allocation of proper routing resources (including link and router-internal buffer allocation). Monitoring and Self-optimisation: Multiple parallel link invade, infect, and retreat activities might lead to fragmented network resources and states. Here, online link-monitoring, -characterisation, and -prediction techniques shall be investigated and strategies developed so to self-optimise established communication paths by re-routing and re-allocation of iNoC resources. Such a mechanism shall be investigated under the term re-infection. It includes searching for alternative communication routes, change of data communication protocol, reassignment of iNoC resources to communication links and adaption to faults as well as dynamic change of bandwidth requests. Self-embedding of Application-specific Communication Topologies: A team of i-lets with heavy inter i-let communication may desire to temporally invade a dedicated path of routing channels between chosen sender and receiver nodes, or even a dedicated NoC topology that reflects the data dependencies between each pair of i-lets. Ideally, such an embedding shall be established in a little amount of time and with low area overhead decentrally by the iNoC routers themselves. Important questions are if, which, and how dependence information between i-lets has to be exchanged, and for how long these have to be stored either fully or partially. Which algorithms will be able to provide correct (establishment of a path, if there exists at least one) and good quality (number of involved router nodes, number of occupied links, dilation, etc.) embeddings? Evaluation criteria are latency, and resulting hardware and data overhead. The investigated algorithms shall respect busy and faulty links and nodes. Self-optimisation of such paths, and methods of self-repair shall be consistently applicable. 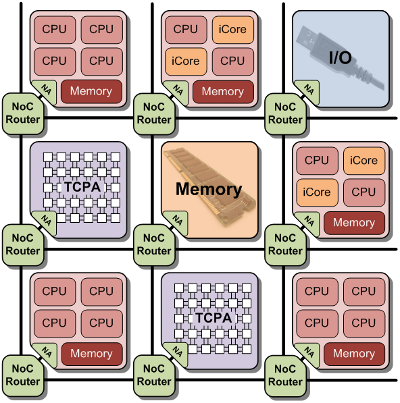 The iNoC connects the tiles in the heterogeneous tile based MPSoC architecture. Through the invasive Network Adapter (iNA) the different tiles (TCPA-tiles, iCore-tiles, RISC-tiles, memory-tiles and I/O-tiles) are connected to the iNoC. The iNoC provides efficient support for reservation and release of communicati- on resources. The reservation of communication resources by applications in the iNoC is realized through dynamically configurable guaranteed service connections.